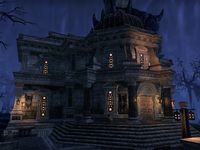 Coldharbour's Mages Guildhall is located in the southwest corner of the Hollow City. Normally, the guildhall is inaccessible until you have rescued Vanus Galerion from the Black Forge. However, you can get there early by exiting the city via the southeast gate and following the wall to the west. You'll need to make one jump from a spike to get into the hall grounds, but it is not very difficult. The hall itself is still locked until you've rescued Vanus, but you can at least get the Striking Locale marked on your map.